My young son is turning 13 soon. This year it's his bar-Mitzvah year which means he has special events throughout the year not only with the family but at school too. One of the highlights of the year is creating a heritage book. This is a few months process where the kids find out about their roots and ancestors through interviews, photos, stories and memorabilia. my son started this process in a very reluctant way, not really understanding why does he need to do such an elaborate work. Slowly he was captured by the stories about far away places and events, the old photos and the customs. He even got to the point of telling me: "I don't understand why we have a time limit on this and why we are graded on it. Such an important work should not be done under pressure. I don't care about the grade I'm doing it because it's important!" 15% of the grade is for presentation. Well...you really thought I would live that to him? I took the job to create our family history book. I didn't want to create a digital book, that seemed to plain for me. Everybody would have that. I wanted to make something special. I decided to create a traditional scrapbook! However I ran into a few problems... First there was a lot of text. Our family history is mostly about the stories and less about the photos, because a lot of them were lost in the Second WW. I had to find a way to include all the text and the photos of each family member on one page or I'll end up with more than a 100 pages which will be a ginormous scrapbook. My solution was to Create interactive pages! But then I ran into another problem...the page protectors, they were in the way. One friend suggested to cut the page protectors where the flaps were and another friend suggested to glue the pages on the protectors. I didn't like those ideas, so I decided to go really old school. I used an old fashion scrapbook with plain paper pages (something like a large sketchbook) that I could glue down the finished pages on. 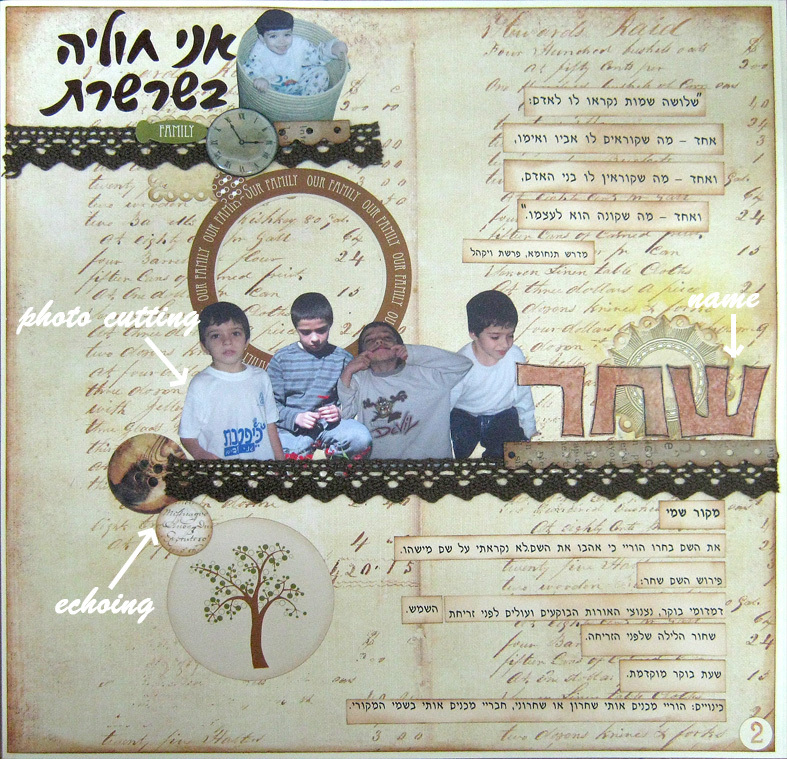 There are a lot of tutorials and blog posts online about how to create a heritage book, organize the materials and photos etc. I want to share with you the different style, approach and creative way that I created our heritage scrapbook. 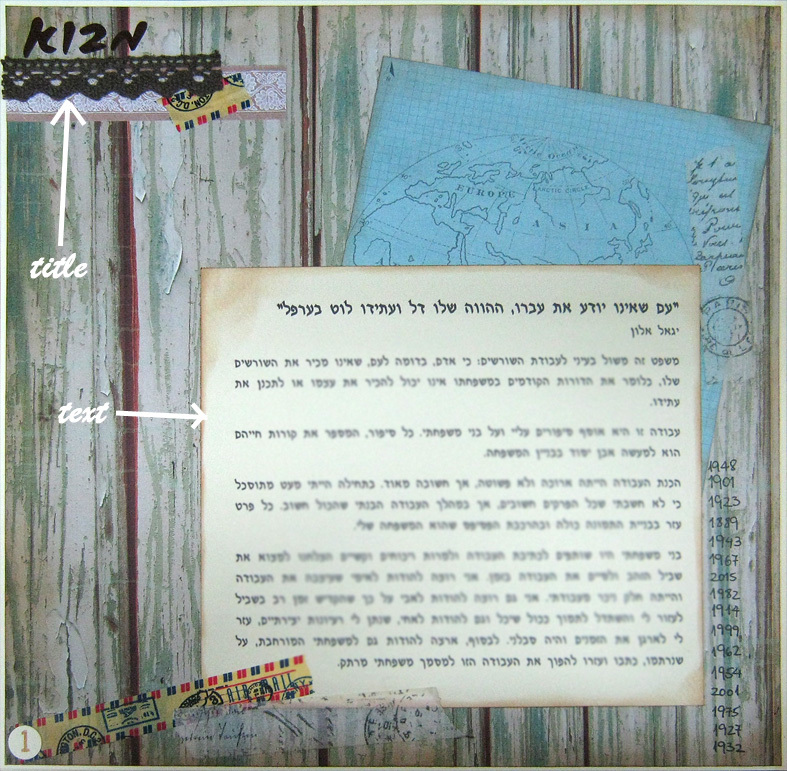 The text is all in Hebrew (and I blurred most of it) but the design is universal and can be done in any language. The scrapbook is divided to chapters. Each chapter started with a page in the same design. Hebrew is written from right to left so the chapter's title was on the top left corner. Each title was spelled with letter stickers and was embellished with a photo or an image and a lace ribbon. I wanted the scrapbook to have a uniform design but not to be boring. All the pages have a vintage shabby chic look that goes well with the theme of heritage and history. I tried to give each page a unique look but still keep it with general theme. I used a lot of layering, travel and maps motifs as well as vintage ephemera. All the text was printed on A4 papers (I don't have a 12x12 printer...another problem I had to solve) that were cut in different sizes. The first chapter is "I'm a link in the chain" and it is all about the writer of the work...my son, who is one link in the chain that is the family. One of the elements of one's identity is their name. So one page was dedicated to the meaning of the name. Next to the name I added a photo collage that seem to jump out of the page. Cutting the image of the person out of the photo is a very effective technique to use different photos and create a collage. One of the embellishments principles I used in this page was echoing. Echoing means you repeat an element in the design. In this page I echoed the word "chain" and added different kinds of circles as the links in it. An interesting way to present data, especially dates, numbers and such is to create blocks. I created a sort of a birth certificate with all the data about my son when he was a baby. I included the usual birth date, weight, parents' details and occupations, but also other more unusual things like zodiac sign and mood. In the interest of not boring you too much or having a long blog post I'm going to divide this post into a few parts. Make sure to tune in on Friday for part 2! 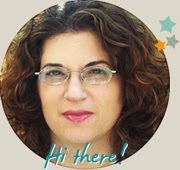 טוב, ברור לגמרי שזו תהיה לא רק העבודה הכי יפה במחזור שלו, אלא הכי יפה שנראתה בבית הספר שלו - והכי מושקעת! 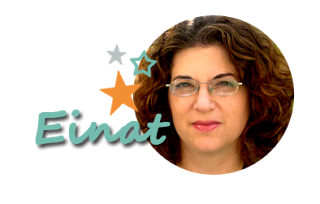 Very beautiful Layout Einat!! lovely papers! Big hugs. I love this, as it has revived one of the original purposes for scrapbooking-memory keeping. Beautiful job. Lucky boy to have this wonderful keepsake ( and the rest that will be made) in his life.